If you're into that sort of thing, The Blob is a likable low-budget creature feature with a ridiculous premise and an even more ridiculous conclusion. 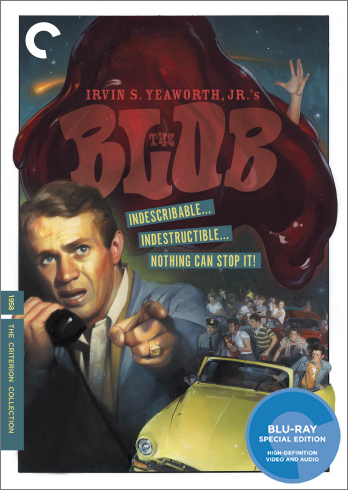 Made for just over $100,000 by primarily industrial filmmaker Irvin Yeaworth Jr., The Blob is a minor standout among films of its ilk simply by virtue of its technical competence, inventive practical effects and solid performances. The film has elements both tongue-in-cheek (Burt Bacharach's goofy title song might just be my favorite thing about the film) and serious (Steve McQueen, in his debut lead role, doesn't really wink at the audience), without ever tipping too far in either direction. This is light, fun drive-in entertainment, and it's lack of apparent striving for more is definitely appealing. The film opens with McQueen's Steve Andrews and Aneta Corsaut's Jane Martin on a lovers' lane date, their tryst interrupted by a meteorite crash nearby. They look for the crash site, but an old man discovers it first, and the gelatinous, pulsing object he finds there has soon attached itself painfully to his arm. Steve and Jane happen upon the man and deliver him to the town's doctor, but the menacing blob with the huge appetite becomes far too much for any one person to contain. As people begin disappearing and Steve tries to convince the local police force of the danger, his rantings are dismissed as a mere teenage prank. Eventually, the authorities become aware of the threat, but it might be too late to put a stop to the ever-growing blob. Although popular culture's value of ironic enjoyment probably means most modern audiences would interpret The Blob as a campy riot, it's not really the kind of detritus that deserves a Mystery Science Theater-style smackdown (or requires one to even get through). Sure, it's a silly movie, and there are plenty of jokes you could make at its expense, but if one is going to enjoy The Blob at all, it ought to be on the film's own terms -- as a well-crafted if totally disposable piece of lite sci-fi/horror. The film may not be all that essential, but it gets a transfer worthy of a canonical film. Presented in 1080p high definition in its original 1.66:1 aspect ratio, The Blob looks fantastic throughout, with sharp, clean images, deep blacks and vibrant colors across the spectrum. Film grain is healthy and consistent, and though a few scenes have some softness around the edges, the elements are clearly in superb shape. One would hardly expect a film of this kind to have been preserved so well, but the evidence is up on the screen. The uncompressed monaural soundtrack isn't quite as impressive, with some distortion and inconsistent volume levels that likely are due to cheap recording equipment. Most everything is intelligible, but there's some straining to catch all the dialogue. Criterion carries everything over from their 2000 DVD release, save for the poster reproduction that came inside the DVD package. Two audio commentaries are the main extras -- one with producer Jack Harris and historian Bruce Eder and another with director Yeaworth and supporting player Robert Fields. A photo gallery of production stills and Blob memorabilia and the film's theatrical trailer are also included. The package includes an insert with an essay by Kim Newman. Some people love The Blob. I can't get on board with the film's reputation as an essential cult item, but it's entertaining enough, and the amazing transfer here is sure to please fans of all enthusiasm levels.